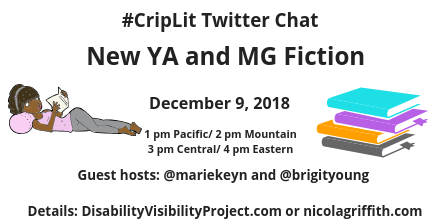 Image description: Rectangular graphic with a white background and black text that reads “#CripLit TwitterChat New YA and MG Fiction, December 9, 2018, 1 pm Pacific/ 2 pm Mountain/ 3 pm Central/ 4 pm Eastern, Guest hosts @mariekeyn and @brigityoung. Details: DisabilityVisibilityProject.com or nicolagriffith.com.” On the left is an illustration of a girl reading lying down, and on the right a pile of books. Both illustrations in colour. You are invited to the fifteenth #CripLit chat co-hosted by novelist Nicola Griffith, and Alice Wong of the Disability Visibility Project®. We are delighted to have Marieke Nijkamp and Brigit Young join us in a conversation about writing, disability, and new Young Adult and Middle Grade fiction. Marieke is the editor of the YA short story anthology, Unbroken, and Brigit is the author of Worth a Thousand Words, a new Middle Grade novel. We look forward to learning more about these great books—just in time for holiday shopping season! Also note: these questions are for everyone. Our hope is that we can all self-promote a little and perhaps give eager readers ideas for gift-giving—or to ask their library to order or independent bookstore to stock. We want to hear about all the marvellous #CripLit out there!